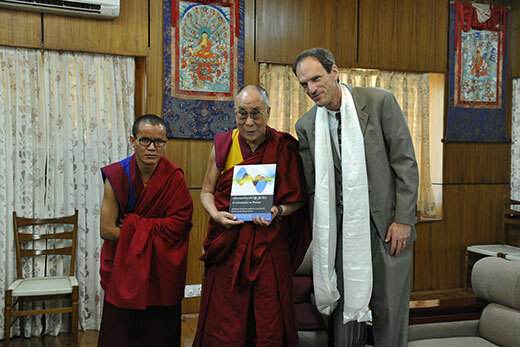 Tibetan monk Geshe Yungdrung Konchok (left) and Emory professor Arri Eisen (right) pose with the Dalai Lama, who wrote an introduction for their new book, “The Enlightened Gene,” which explores how insights from scientists and monastics enrich understandings of biology, physics and other sciences. Serving a community in exile, the Dalai Lama has been charged not only with keeping spiritual traditions alive, but cultural ones as well. He invited Emory to form the Emory-Tibet Science Initiative (ETSI) in 2007, as a long-range project to exchange Buddhist cultural and intellectual wisdom and cutting-edge scientific knowledge. The first two cohorts of 77 monks and nuns completed their five years of summer education in 2012 and 2013, respectively, and have since gone off to monastic academies to share their newfound knowledge – and how it ties to traditional beliefs. Some Buddhist traditions have helped anchor the project, Eisen notes. Buddhists embrace all worldviews, to better understand their own thinking. Likewise, Buddhist teachings are available to all seekers, without conversion. Integrating biology and Buddhism can be deceptively simple at times, Eisen found, while addressing some of the larger questions of what it means to be human. In some of his initial teaching, Eisen observed that monks struggled at first with the basic concept that living things are made of cells. As Namgyal explains, all living beings have minds and bodies to Buddhists, different words that made “cells” a difficult concept to students wondering if bacteria feel pain. But such innovative thinking is exactly what science needs, Eisen says, if only because the best discoveries and learning come when people are able to identify points of tension within a subject. The book reveals the community of neuroscientists and monastics connected by their interest in the mind and body, whose points of view can affirm and challenge each other. For instance, the growing understanding of the “gut microbiome” — the cluster of intestinal microbes thought to help regulate the immune and nervous systems — can also be viewed as an illustration of the spiritual concept of coexisting, sentient life. “On the large scale, integrating science and faith changes the way we think about science and therefore some of the big scientific questions,” Eisen says.